Fortunately, she has plenty of brothers and sisters to ice instead of her. Hey, if a cupcake manages to communicate with me, it deserves special treatment. These are crazy gorgeous … I can’t stop staring at them! Wow, those look amazing! Love the colors! Thanks! I hope yours turn out great. I made the frosting for these lemon flavored. Awesomeness, do you have any pictures of one cut in half to get the full psychedelic experience? Yup! Right here on the reveal page. That’s awesome! I just made some rainbow cupcakes too- SO cute! Can’t wait to see what you did with yours, the pictures look amazing. Thanks! I’ve got the post up now, if you want to check it out. Awesome cupcakes!!! But I think I missed the recipe, or how you got them to look like that! Did you just make a basic white cupcakes and separate it into different bowls and added food dye? Or are those different flavors? I wrote more about how I made them here on the new post showing what I was making, but I didn’t go into directions because I didn’t feel like they were all that original–just lucky with the heart! It seems like lots of people have been doing the rainbow cupcakes lately. But, yes, it’s just a vanilla cupcake recipe (from The Whimsical Bakehouse, which is a great cake decorating book if you like vivid colors like this) separated into three bowls and with A LOT of food coloring. I used the Wilton paste-style coloring so the batter wouldn’t get diluted–they’re more potent, anyway. For the red, I mixed Christmas Red and Burgundy. It’s always a challenge to get a good red. Often if you let the batter sit for a few minutes, though, the color will deepen, so I started with the red, did the other two, and then came back and adjusted the red. Awesome, thanks! I have only really worked with food dye when making red velvet cake, but never have I gotten such a gorgeous color! I’ve seen the Wilton paste colorings, I guess now I’ll have to pick them up!!! And I just looked up the Whimsical Bakehouse, and I’m so getting it! Thanks! Great, glad I was able to help! The Wilton paste colorings are really helpful, especially when you’re adding them to baked goods where it’s even more important that you don’t change things too much. Just be sure to put a lot in, and do it right away so you don’t keep stirring and stirring and toughen the cakes…I had a bit of an issue with that this time. 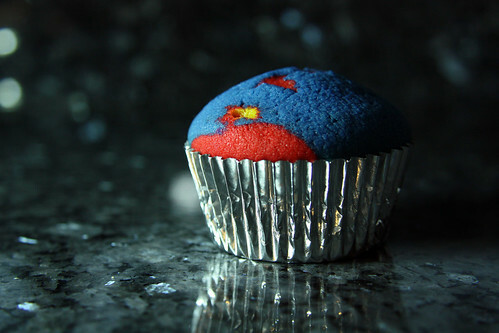 My mind is blown by these cupcake images. I don’t believe I could find anything else that looks like them on the web. Is this your own recipe? 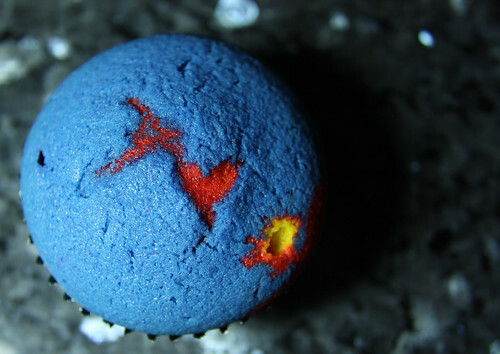 I never thought I adore something that had that much food coloring in it, but I do! haha… Gorgeous! Haha, I’m the same way! 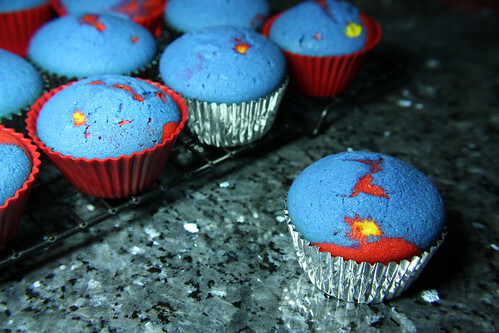 I won’t buy or eat anything with food coloring…but I’ll bake with it. 🙂 I tried natural food colorings for awhile but they made me pull my hair out and they weren’t vivid, so I’ve just decided that moderation is key. That and I tend more to take photos of the results than eat them. Can I have the recipe for this cupcake? It’s the vanilla cupcake recipe from The Whimsical Bakehouse, which is a really fun cake decorating book full of really brightly-colored cakes. I took the batter and divided it among three bowls and added a ton of food coloring, then layered the colors and baked it as usual. Those are amazing! Wow! I am very impressed. This is way too pretty. No need for frosting at all. 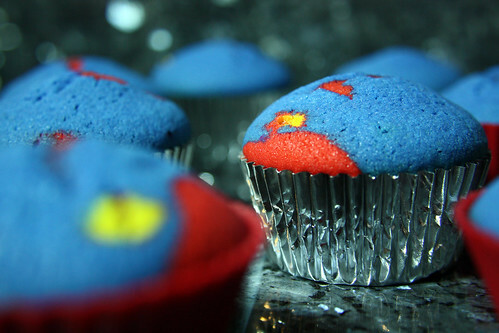 They look like Superman Cupcakes!